In weeks past, we've looked at the bathing suits of the late 1800s and early 1900s. I don't believe any of us were asking ourselves where we could run out and purchase one. Made of wool and way too much material, they were not something we wanted to bring back into fashion. Personally, I find this week's selection of vintage photos, postcards and patterns to have just the opposite effect. I have fallen in love with beach pajamas! This could be because the name of my little studio is Pajama Graphics. (I chose this name because I work at home and practically live in my own pajamas.) Obviously, I love pajamas and you all know I love the beach, so what could possibly be better than beach pajamas? Two fashion trends are incorporated in a pajama ensemble which combines an eggshell silk crepe sunback jumper with a green and eggshell gingham-checked coat. The wide trousers of imperial green flat crepe are slit to the knees. (Dan Friedlander, Inc.) A chartreuse satin coat tops a maize senia (?) pajama in a three-piece ensemble which is distinguished by fabric buttons of orange satin. A RESORT fashion show, arranged by Lord & Taylor, in which Junior League girls acted as mannequins, was part of the program of a recent benefit bridge party given at the Ritz Carlton. At the right, a three-piece ensemble of jersey is worn by Miss Dorothea Chard. The tuck-in shorts and mannish (?) are accompanied by a long coat, elaborated with varied colored bands of jersey, and lined with white terry cloth. Below, at the left, Miss Jassine Chase wears a beach pajama costume, with miliary striped trousers. In the center, Miss Dorothea Chard shows the costume described above, and at right, Miss Alice Walker exhibits a (?) beach costume, the cardigan jacket topped by a matching handkerchief scarf. The full-brimmed straw hat and variety in clog footwear, contribute to the effectiveness of these costumes. 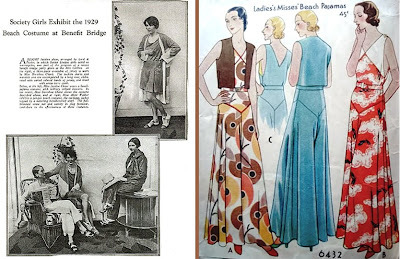 From Style Sources Magazine 1929 Issue. 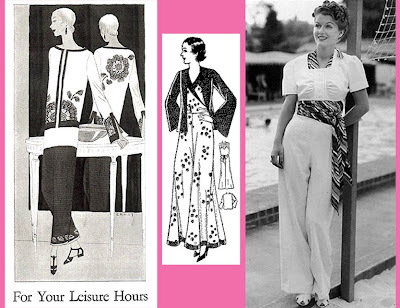 On the right is another pattern from McCall of a bolero-style beach pajamas. 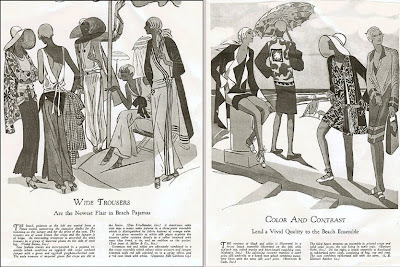 The illustration on the left appeared in the the Ladies Home Companion in 1929. A most interesting find was the image on the left from the Idaho State University Special Collection. Title: Female Figure in Multicolored Beach Pajamas and Large Hat for Kiss Me Again (working title: Mlle. Modiste). Lower right corner of the image reads: "Mlle Modiste" "Beach Pajama" (underlined) in pencil, "HBW" (initials for Movie producer Hal B. Wallis) in pencil. #1 Sport Costume in pencil. Signed by Stevenson. 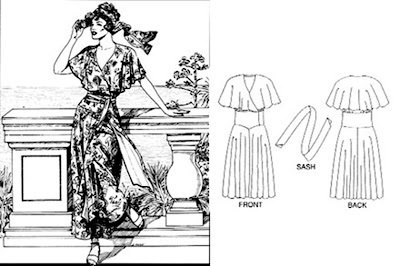 On the right is a pattern image that appeared in Pictorial Review Quarterly in the Fall of 1930. 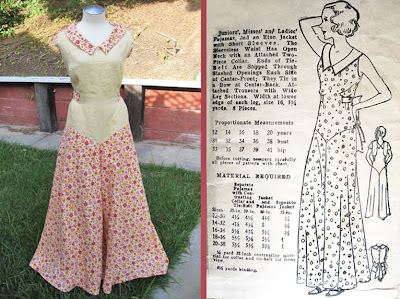 You never know what you'll find when you start out researching something of interest, so imagine my delight when I came across a blogger who sews vintage clothing! 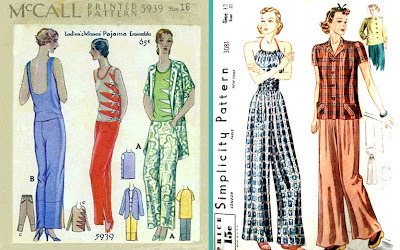 I was in google images when I spotted this photo on the right and recognized it as beach pajamas from a pattern I already had in my file. Her blog Wearing History is just wonderful and her Etsy store is simply divine! 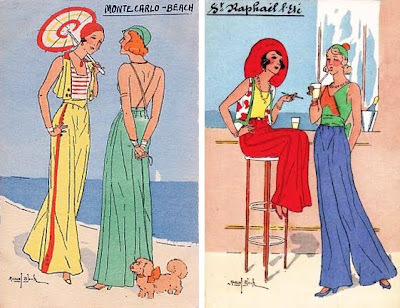 Now you know the French were right there when it came to the new trends in beach attire, so I was not surprised to find these vintage French postcards of beach pajamas. Want to know something even better? 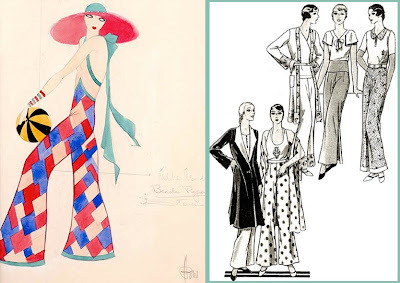 There's an entire blog dedicated to vintage French pajamas, with tons of pics. Visit La Mode Pyjama, but if you don't speak or read French, be prepared to just look at the pretty pictures. As I said at the beginning of this post, I just fell in love with beach pajamas. They remind me of the old movies from the 1940s — glamorous and ultra-feminine. I used to have a few vintage lounging pajamas to wear around the house when I lived in Hollywood, one was a pale pink satin dress-style, the zipper was so large and heavy and ran all the way down the front. I never heard of or had beach pajamas though, I hope it's not too late! So, what did you think of this weeks beach fashions? Would you wear them today? This is so cool Rhonda, and what a neat Etsy shop! She has a vintage outfit called Make Mine Parisian for $25! It was actually made in the 80's but I can just envision Leslie Caron in it with a beret, in the movie "Gigi".. I love it. I'd love to wear them! Like you I work at home, love pajamas and you of course the beach. This is the first time I hear about beach pajamas..., I mean, aren't they just perfect for us! Hi Sue, I saw that outfit in her shop and thought it was perfect! I also loved the little sailor outfit she made, she is so talented! Maya, I knew you would love these beach pajamas! I knew about lounging pajamas made for entertaining, but never knew about these. I may just get a pattern and give it a try! They look so comfortable and cute! Love this post! Those beach pjs are gorgeous. I'd love to wear them, too. Like you, I would at home and often get so caught up in my work that I realize it 4pm and I am still in my pajamas!!! At least, with pajamas like these, I'd be stylish! I love this style, it makes me feel free and light as air, with the ocean breeze on my side! Just saw your comment on my blog, ironically I totally grew up on watching Somewhere In Time, my dad and I watched it since I was little. I LOVE LOVE that movie, thanks for reminding me of it! Hi Rhonda! I loved this post and seeing the photos of olden beach pajamas! They remind me of the olden movies. Love 'em! My mom says she once had several pair of beach PJs. Wish she still had stashed them in the back of the closet. I may never be able to fill her shoes but her PJs would fit me just fine. Thanks for this interesting and fun post! Love the pics and would love to have some 'beach pajamas'. Funny, my neighbor was walking her dog this afternoon and had some really, really wide pants on and I thought it a little strange...now I know, she had her 'beach pajamas' on!!!! I think it's time to bring them back!